We are pleased to be able to pass on that Clare McCaldin is performing her narrated recital Haydn’s London Ladies in London on 20 September. This will be the full-length concert version, including a complete performance of the celebrated cantata Arianna a Naxos. 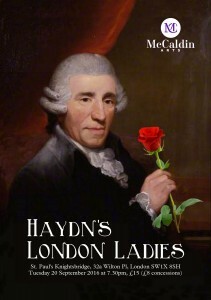 We worked with Clare on the detail surrounding the women that Haydn met on his successful visits to London in the 1790s. With her production company McCaldin Arts, Clare worked up a lunchtime recital, first given at London’s Foundling Museum and then a full-length concert recital, first given in the Swindon Recital Series, run by her accompanist, Paul Turner. It is this latter show that Clare is presenting at St. Paul’s Church, Knightsbridge on 20 September. St Paul’s is a popular, central church next to the Berkeley hotel on Hyde Park Corner. The church has recently acquired a Steinway model D grand piano, a beautiful instrument that makes for fine music making. This concert begins a new, concerted series of concert-giving; the church is already associated with high quality music with its professional choir and is used regularly by the BBC for recording and broadcasting.